Aim: The aim of this study was to evaluate and compare the fluoride ion release and uptake of glass ionomer cement GP IX Extra (GE), EQUIA® Forte Fil (EF), Beautifil Bulk (BB), Dyract® XP (DXP), Tetric N-Ceram® (TNC) in vitro. Materials and Methods: The restorative materials were divided into five groups (n = 12), namely G1 – GE, G2 – EF, G3 – BB, G4 – DXP, G5 – TNC. Fluoride release was checked using fluoride ion-selective electrode (Orion 9609BNWP, Ionplus Sure-Flow Fluoride, Thermo Scientific, USA) at time intervals of 1 day and thereafter at 3, 7, 14, 21, and 28 days. Following this, fluoride recharge was done with 1.23% acidulated phosphate fluoride gel (12,300 ppm, Pascal International Inc., 2929 Northup Way, Bellevue, USA) after 28 days and each sample was re-checked for fluoride release at the same time intervals. Statistical Analysis: One-way ANOVA with post hoc Games–Howell test for intergroup and repeated measures ANOVA with post hoc Bonferroni test for intragroup analysis. P < 0.05 was considered statistically significant. Results: On intergroup analysis, Group 2 showed high values of fluoride release and recharge at all-time intervals which were significantly higher (P < 0.001) than Groups 1, 3, 4 and 5. Intragroup analysis showed significantly higher (P < 0.001) fluoride release and recharge at the end of day 1 which decreased progressively with time for all the tested materials. Conclusion: EF showed the highest fluoride release and recharge potential across all time intervals compared to other tested restorative materials and the greatest fluoride release was seen on day 1. Glass ionomer cement (GIC) is considered to be a fluoride reservoir which maintains a steady flow of fluoride ions into the surrounding tooth structure, thus enhancing the resistance to secondary caries., However, inadequacy of conventional GIC to be used in stress-bearing area has led to the development of newer fluoride-releasing materials with better physical properties. GIC GP IX Extra (GE) is a fluoride-releasing cement with addition of proprietary smart glass fillers imparting superior physical properties and is suitable for posterior restorations. EQUIA® Forte Fil (EF) is a glass hybrid restorative material with ultrafine, highly reactive glass particles, with fluoride-releasing property. Beautifil Bulk (BB) is a bulk fill, light-cure, radiopaque restorative material with incorporation of surface prereacted glass ionomer (S-PRG) filler based on fluoroboroaluminosilicate glass. Dyract® XP (DXP) is a compomer containing strontium-fluoro-silicate glass filler in which a glass–ionomer hydrogel formation through a delayed acid–base reaction leads to fluoride release. Tetric N-Ceram® (TNC) is a BisGMA based composite resin containing fillers such as yttrium fluoride (YbF3) which release fluoride from the material. 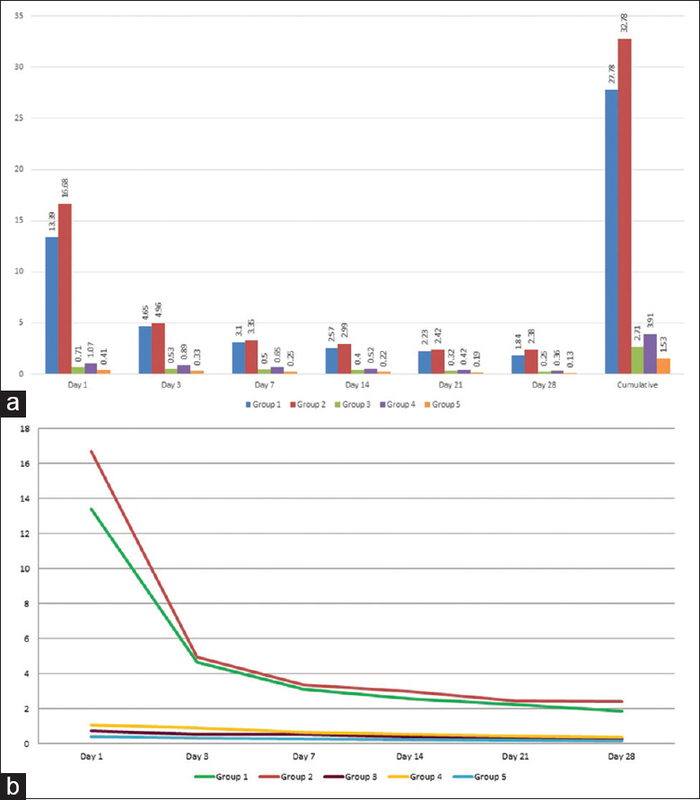 This study evaluates and compares the fluoride release and recharge ability of five different posterior restorative materials. A total of sixty disc-shaped samples of 6 mm × 4 mm dimension were made from five different materials using a Teflon-coated mold following manufacturer's instructions and divided into five groups (n = 12). G5 – TNC (Ivoclar Vivadent, Schaan, Liechtenstein, LOT U18939). The material was infused into the Teflon mold and pressed between two glass slabs with a transparent matrix in between and allowed to set inside the mold for 7 min through chemical curing or light cured (Elipar, wavelength 430–480 nm; light intensity 1200 mW/cm2, 3M ESPE, St. Paul, MN 55144-1000 USA 1-800-634-2249) through the glass slides for 40 s on both the surfaces. Specimens were taken out of the Teflon mold and light cured for 40 s on the sides and stored at 37°C in 100% humidity for 24 h and later transferred into polyethylene containers containing 10 ml of deionized water. Fluoride release was checked using fluoride ion-selective electrode (Orion 9609BNWP, Ionplus Sure-Flow Fluoride, Thermo Scientific, USA) coupled to a benchtop analyzer (Orion Star™ Series ISE Meter, Thermo Scientific, Beverly, USA) with detection limit at ±0.001 ppm, and all data were recorded in ppm at time intervals of 1 day, 3 days, 7 days, 14 days, 21 days, and 28 days. This procedure was repeated for all the samples at different time intervals. Ten percent by volume of total ionic strength adjustment buffer–III solution containing 1,2 cyclohexanediamine tetra acetic acid (4 g/L) was added to the containers and thoroughly mixed with a magnetic stirrer for 120 s and subjected to fluoride ion estimation. Calibration was checked with 1.25, 2.5, 5, 10, and 100 ppm standard solution at regular intervals. At the end of 28 days, each specimen was rinsed with 5 ml of deionized water three times over and then air dried for 2 min. It was subjected to 2 g of 1.23% acidulated phosphate fluoride (APF) gel (12,300 ppm, Pascal International Inc., 2929 Northup Way, Bellevue, USA) following manufacturer's instructions., Each sample was immersed in 10 ml of fresh deionized water and rechecked for fluoride release at similar time intervals. Statistical analysis was done using Statistical Package for the Social Sciences (SPSS) version 18 (SPSS Inc, Chicago, Illinois, USA). 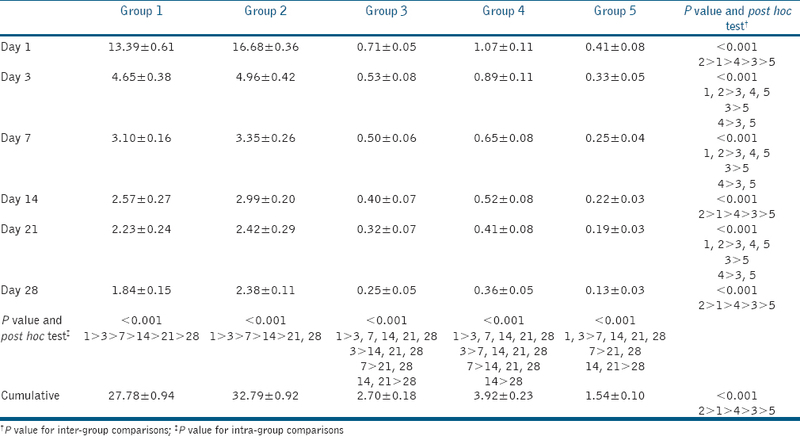 One-way ANOVA with post hoc Games–Howell test for intergroup and repeated measures ANOVA with post hoc Bonferroni test for intragroup was used to compare fluoride release and recharge among the groups. P < 0.05 was considered statistically significant. Intergroup analysis showed that G2 had the highest amount of fluoride release which was statistically different (P < 0.001) from all the other tested groups followed by G1, G4, G3, and G5 showed the least amount of fluoride release [Figure 1](a), [Table 1]. On intragroup analysis, the fluoride release was seen to be decreasing across all the time intervals and the difference seen among them was statistically significant (P < 0.001) [Figure 1](b), [Table 1]. 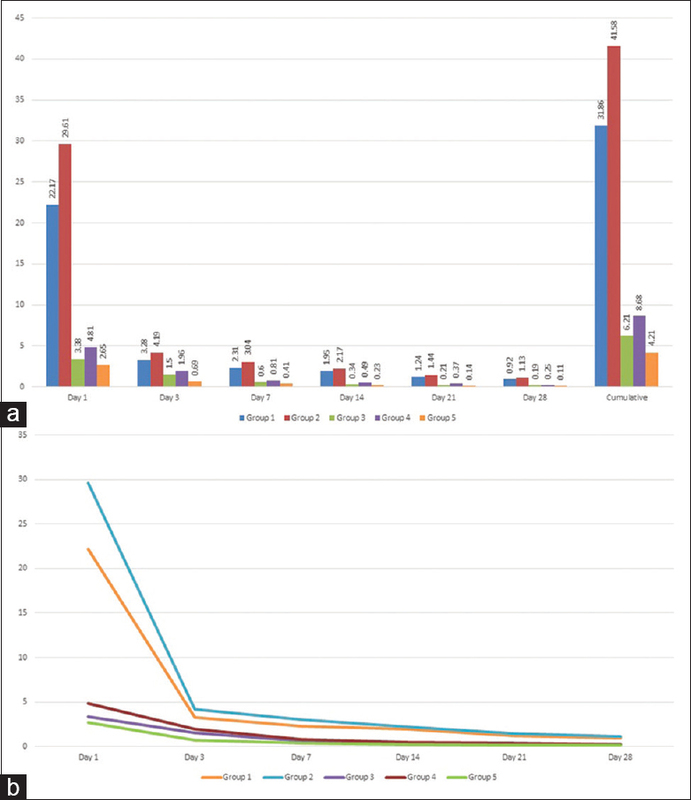 Similar results were obtained for fluoride recharge estimation, wherein G2 showed the highest fluoride uptake and re-release followed by G1, G4, G3, and G5 in the descending order [Figure 2](a), [Table 2]. 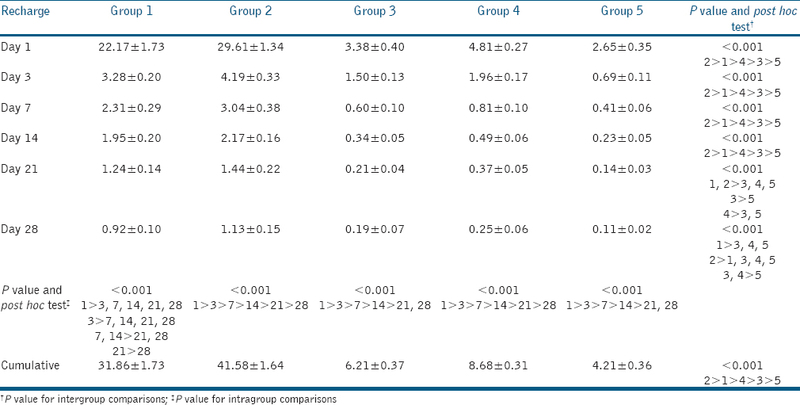 Intragroup analysis demonstrated fluoride re-release values to be decreasing with time and this was consistent with all the groups [Figure 2](b), [Table 2]. Various materials considered in this study are indicated for restoration of carious teeth in stress-bearing areas. Xu and Burgess discussed about the continuum of dental restorative materials based on the resin content, wherein one end of the continuum is occupied by materials with no resin content and other end by materials with high resin content. Moving across the continuum from glass ionomer-based materials to compomers, giomer, and composites, the resin content of the materials increases. The ability to release fluoride depends on its filler content and the nature of glass-ionomer hydrogel matrix phase formed. Fluoroaluminosilicate glass is the major component of the filler and the main source of fluoride in all fluoride-releasing materials in this study except for TNC. The fluoride release is high initially and decreases progressively with time coinciding with results of the previous study and can be attributed to the “burst effect.” Thereafter, it declines rapidly by the end of the 3rd day. Similar findings pertaining to GIC were seen in other studies.,,, GE demonstrated significantly higher amount of fluoride release compared to BB, DXP, and TNC across all time intervals which is in accordance with results of other studies., Fluoride release stabilizes later and is plateaued within 10 to 20 days and sustained at a lower level. EF which has shown to have high fluoride release, significantly higher (p<0.001) than GE, DXP, BB and TNC across all time intervals. Fluoride release pattern was similar to that seen in GE. Initially, there is high amount of fluoride release-burst effect, followed by a sharp decrease at the end of 3rd day and constantly decreasing fluoride release thereafter. This is plateaued with time and sustains at a lower level for a relatively long period. EF constitutes of proprietary ultrafine, highly reactive glass particles, dispersed within the conventional glass ionomer structure. Hence, it can be assumed that the glass ionomer hydrogel matrix phase formed due to the acid base is thicker than that of GE and hence, the higher amount of fluoride release. Furthermore, the ultrafine fillers may increase the surface area for acid–base reaction to take place leading to enhanced fluoride release. The burst effect from GE is probably due to an acid–base reaction, with the amount of fluoride released proportional to the concentration of fluoride in the material. Similarly, the burst effect seen with EF can be justified. BB showed smaller amount of controlled fluoride release in this study. It contains S-PRG filler which acts as the main source of fluoride release. They are formed by pre-reacting fluoroaluminosilicate glass and acid prior to the inclusion into the resin matrix. Thus, the fluoride glass within has little or no glass ionomer hydrogel matrix phase. The acid–base reaction is more extensive in GICs and results in thicker, well-defined matrix layer in these material, whereas in case of BB and DXP the glass-ionomer hydrogel matrix phase formed is very limited. This explains the difference in the fluoride released by GE compared to BB and DXP. It is seen that fluoride released by DXP was significantly higher than BB and was in accordance with a previous study but, differed from other studies, which used Dyract instead of DXP. Such discrepancy can be attributed to the composition of DXP containing additional strontium fluoride (SnF2) fillers which enhance the fluoride release compared to Dyract. Moreover, the particle size of DXP (0.8 μm) is smaller than Dyract (2.4 μm) and smaller particle size leads to larger surface area and better fluoride release. TNC contains YbF3 filler which is the main source of fluoride. Fluoride released is not a function of the setting reaction but is due to the passive leaching that may occur from filler particles by means of exchange reaction due to water absorption by the composite. This explains significantly lower (P < 0.001) fluoride release by TNC and is in accordance with a previous study. Cumulative fluoride release of the materials also followed the same order with EF group having the highest release and TNC showing the least. The cariostatic action associated with fluoride-releasing materials is attributed to a sustained release of fluoride and the fact that fluoride levels leached from materials decreased over time, intermittent replenishment of fluoride into the restorative materials is essential. For all materials the fluoride release increases substantially after topical fluoride application. Recharge profile was similar to release with EF having the maximum release followed by GE, DXP, BB, and TNC and it was statistically significant across all the groups. The highest values were recorded at the end of the 1st day after recharge which decreased sharply by the end of the 3rd day and then a gradually decreasing gradient returning to near pre-exposure levels by the end of the 28th day. These results were similar to other studies.,,,, Furthermore, the glass-ionomer hydrogel structure formed within the material plays a key role in determining the extent of fluoride uptake. Based on this, the results can be rationalized where in, EF might have a thicker glass-ionomer hydrogel matrix phase and hence, shows a better uptake and re-release of fluoride, followed by GE, DXP, and BB. TNC showed the least recharge ability owing to its high resin content reducing its overall permeability and solubility. Cumulative fluoride recharge also followed the same order with EF group having the highest release followed by GE, DXP, BB, and TNC having the least. The storage medium used in this study was deionized water. With no existing ions in this medium, the use of deionized water is considered to give an accurate estimate of the fluoride ions released. This view has been endorsed by other authors., Fluoride ion estimation was done using modified fluoride ion electrode method which is a highly sensitive, specific, and rapid technique. With regard to the types of topical fluoride used, 1.23% APF gels seem to be more effective than neutral 1% NaF gel and 0.001% CaF2 or 4% SnF2 agents. Based on the current findings, it can be said that all the materials with the ability to release fluoride also have the ability to uptake fluoride from topically applied gels. Hence, regular application of topical fluoride is essential to allow steady supply of fluoride ions from such materials thereby, reducing the incidence of recurrent caries in high-risk patients. Within the limitations of the current study, the tested restorative materials demonstrated fluoride release and recharge potential (EF > GE > DXP > BB > TNC). New materials such as EF have shown promising results owing to its very high fluoride release and recharge potential. Yip HK, Lam WT, Smales RJ. Fluoride release, weight loss and erosive wear of modern aesthetic restoratives. Br Dent J 1999;187:265-70. Xu X, Burgess JO. Compressive strength, fluoride release and recharge of fluoride-releasing materials. Biomaterials 2003;24:2451-61. Dionysopoulos D, Sfeikos T, Tolidis K. Fluoride release and recharging ability of new dental sealants. Eur Arch Paediatr Dent 2016;17:45-51. Neelakantan P, John S, Anand S, Sureshbabu N, Subbarao C. Fluoride release from a new glass-ionomer cement. Oper Dent 2011;36:80-5. Pedrini D, Delbem AC, de França JG, Machado Tde M. Fluoride release by restorative materials before and after a topical application of fluoride gel. Pesqui Odontol Bras 2003;17:137-41. Creanor SL, Carruthers LM, Saunders WP, Strang R, Foye RH. Fluoride uptake and release characteristics of glass ionomer cements. Caries Res 1994;28:322-8. Forsten L. Fluoride release and uptake by glass-ionomers and related materials and its clinical effect. Biomaterials 1998;19:503-8. Naoum S, Ellakwa A, Martin F, Swain M. Fluoride release, recharge and mechanical property stability of various fluoride-containing resin composites. Oper Dent 2011;36:422-32. Mousavinasab SM, Meyers I. Fluoride release by glass ionomer cements, compomer and giomer. Dent Res J (Isfahan) 2009;6:75-81. Freedman R, Diefenderfer KE. Effects of daily fluoride exposures on fluoride release by glass ionomer-based restoratives. Oper Dent 2003;28:178-85. Itota T, Carrick TE, Yoshiyama M, McCabe JF. Fluoride release and recharge in giomer, compomer and resin composite. Dent Mater 2004;20:789-95. Bansal R, Bansal T. A comparative evaluation of the amount of fluoride release and re-release after recharging from aesthetic restorative materials: An in vitro study. J Clin Diagn Res 2015;9:ZC11-4. Attar N, Turgut MD. Fluoride release and uptake capacities of fluoride-releasing restorative materials. Oper Dent 2003;28:395-402. Preston AJ, Agalamanyi EA, Higham SM, Mair LH. The recharge of esthetic dental restorative materials with fluoride in vitro-two years' results. Dent Mater 2003;19:32-7. Lee SY, Dong DR, Huang HM, Shih YH. Fluoride ion diffusion from a glass-ionomer cement. J Oral Rehabil 2000;27:576-86. Harhash AY, ElSayad II, Zaghloul AG. A comparative in vitro study on fluoride release and water sorption of different flowable esthetic restorative materials. Eur J Dent 2017;11:174-9. Gao W, Smales RJ, Gale MS. Fluoride release/uptake from newer glass-ionomer cements used with the ART approach. Am J Dent 2000;13:201-4.